LIQUORGAS is the name of our new research project in the topic of computer aided process engineering funded by Comunidad de Madrid. During the next years we will be working on a very promising research programme related with the use of ionic liquids as green solvents for the process industry. Thus we join a strong and very well established consorptium coordinated by Professor Francisco Somolinos (Universidad Complutense de Madrid) in collaboration with Universidad Autónoma de Madrid and Consejo Superior de Investigaciones Científicas. In the next months, we will work on the development of technical and economic evaluations of ionic liquids as separation agents in processes such as gasoline desulfurization or CO2 capture. In this way, we will try to fill the gap between thermodynamic models that are successfully applied for the evaluation of thermophysical properties of ionic liquids (COSMO based models) and the industrial application of these components. Here I go with my first post. I am happy to announce that is very likely that we may work in a new Educational Innovation Project. It is titled “Flipped learning in chemical engineering laboratory practices”. But, what do we intend to do? Our idea is to change the way traditional chemical engineering laboratory practices are carried out. To change from a professor centered point of view to a student center point of view. You can find more information about this topic on the web (i.e. 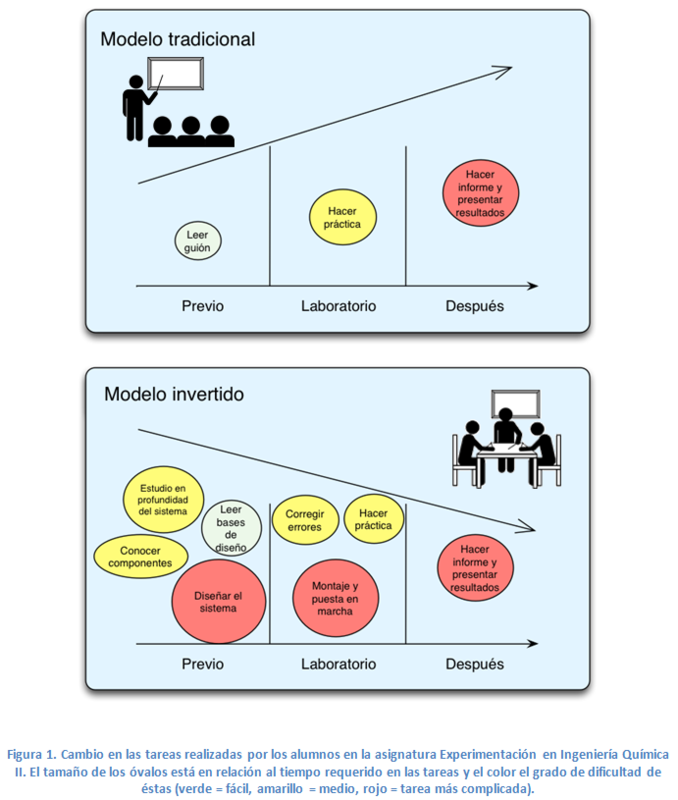 http://www.theflippedclassroom.es/). Essentially, it is summarized in Figure 1. We expect we will do that by using new open hardware microcontrollers. Its low cost and huge documentation available make them affordable and easyly used by students, allowing them to desing, start up and carry out their own experiments.